A comic crime novel. With issues. ONE OF THE BEST MYSTERIES OF 2015 - Kings River Life Magazine. 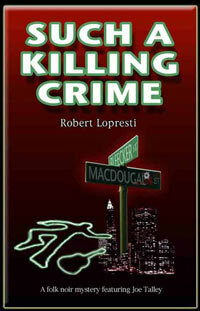 "What do you expect when you pick up a novel about New Jersey mobsters? Robert Lopresti's GREENFELLAS has plenty of genre motifs, but it's the unusual characters, vistas, and twists that will surprise and amuse the reader. In GREENFELLAS, Lopresti defies the reader's expectations in a contemporary way, and the result is a fun and suspenseful read." - Jackie Sherbow, Alfred Hitchcock's Mystery Magazine. “If Carl Hiassen and Al Gore had collaborated on RESERVOIR DOGS, it might have come out something like GREENFELLAS" - Steve Steinbock, Ellery Queen's Mystery Magazine. Get your copy now, or we'll recycle it. Two of my favorite bookstores are Village Books and Seattle Mystery Bookshop. Or read how to buy my books.